Transformative. Ask anyone on Rowan University’s Glassboro cam­pus today and that’s what they will say about the effect of a Burlington County man’s promise to a small, South Jersey college. Henry Rowan may not have known it in 1992, but when the CEO of Inductotherm Industries pledged to give a $100 million gift to then-sleepy Glassboro State College, it changed the course of higher education in South Jersey and philanthropic efforts at public institutions nationwide. Twenty years later, the college—now a well-known university boasting an enrollment of more than 11,000 students, a medical school in Camden, a technology park, and numerous other educational opportunities —is still feeling the ripple effects of Henry and Betty Rowan’s extreme generosity. Interim Provost James Newell was one of them. He came from North Dakota to Glassboro as a chemical engineering professor and helped to teach the first class, which graduated in 2000. But in the late 1990s, South Jersey had to compete with some of the best engineering programs in the region, such as Rutgers, Penn State and the University of Delaware. Glassboro State College—which was later named Rowan College, and then Rowan University—instead took a hands-on clinical approach, developing a program that would train their engineers for real world applications in the 21st century. “You can’t learn engineering from someone talking about engineering,” says Newell. Unlike programs that were developed decades before, Rowan got to start with a blank slate. The program was built with modern equipment and the latest technology, offering majors in chemical, civil and environmental, electrical and computer, and mechanical engineering. Thomas Xenakis, a product of Rancocas Valley Regional High School, was one of about 100 students in the first engineering class and graduated with a degree in mechanical engineering. Today, he’s the vice president of the commercial department at Concord Engineering in Voorhees and also sits on the College of Engineering’s Dean’s Advisory Council. Since that first class graduated, the college has continued to place among the top 25 undergraduate engineering programs in the country, ranked by the U.S. News & World Report. With each new graduating class, the College of Engineering raised the bar of expectations, not just for the engineering students, but for students in other academic fields. “Suddenly, we became a more attractive destination to people interested in math and science,” says Newell, and that in turn attracted more education students. Better students meant a need for better faculty, which built momentum. Rowan saw its SAT scores rise, its selectivity rise and the performance of its graduates rise. It has led to new buildings and programs such as the engineering building named Rowan Hall, the Keith and Shirley Campbell Library, the new education building named after former President Herman James, the Edelman Planetarium, and the South Jersey Technology Park. And just this past summer, Rowan University welcomed its first class of 50 medical students at the Cooper Medical School of Rowan University in Camden. Just weeks later, after a winded battle with the state Legislature, Gov. Chris Christie signed a historic higher education restructuring bill that, in part, provided Rowan University with a much-needed research designation. “That doesn’t happen without an engineering program and that doesn’t happen without the Rowan gift,” Newell says. These advances are seen as tremendous opportunities for other academic departments at Rowan University, according to Dr. Steven Chin, associate dean of the College of Engineering. “I see us continuing to be leaders and actually more so than in the past,” Chin says, adding he’s already in discussions with the medical school’s dean, Dr. Paul Katz, about collaborative education programs such as biomedical engineering in the health care field. “[Henry Rowan’s] vision, and of course his generosity, made this all possible, and I’m not just saying that gratuitously. 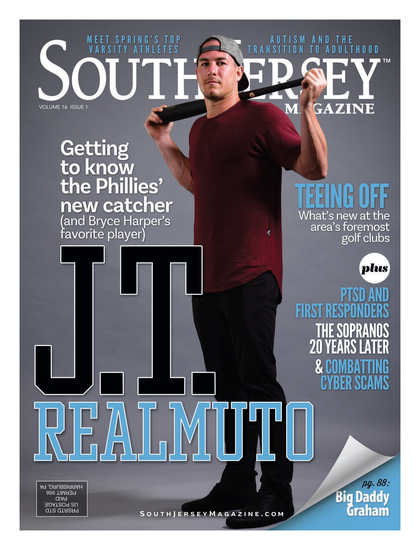 We would not have been looked at as an institution to be in the forefront in South Jersey” had it not been for him, Chin says. Prior to the Rowans’ donation, large gifts of this kind were not commonplace. However, in the past two decades, more than 120 donations of $100 million or more have been made to colleges or universities throughout the country. And in 1992, the Rowan University Foundation’s assets totaled just $787,000, but the unprecedented gift helped the foundation’s market value grow to more than $148 million this past year. “Wise people with means to give look at this as an example and think, ‘What kind of impact will my gift have?’” says Houshmand. “The gift propelled us to the potential where decision makers and people who have the ability to make an impact realize this institution has the ability to adjust to major changes and embrace big challenges. Head of the Class Rowan’s new president has been schooled to lead university. Ali Houshmand considers himself lucky to be called Rowan University’s seventh college president. The 57-year-old Iranian native has called Rowan University his home for the past five years, but his path to the presidency has been different than his predecessors. After a childhood in Tehran, Houshmand moved to the United Kingdom where he attended the University of Essex and earned a bachelor’s and master’s degree in mathematics. With a desire to come to the United States, he then found himself at the University of Michigan, where he earned a second master’s degree and a doctorate in industrial and operations engineering. He spent time as interim provost at Drexel University in Philadelphia before coming to Rowan University in 2006 as the college’s provost and senior vice president for Academic Affairs. When former President Donald Farish departed last summer in 2011, Houshmand took on the title of interim president. The college’s board of trustees decided to drop the “interim” title before his name this summer, amid a turbulent time for the university as the governor tried to restructure higher education in New Jersey. 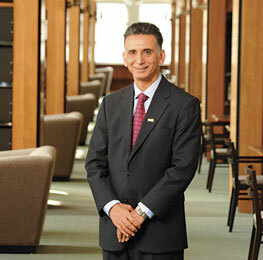 But Houshmand sees it all as an opportunity, not only for him but for the college and its students and faculty. “At the end of the day, you’re talking about the lives of 12,000 kids. That is a monumental challenge. At the same time, I can say I have been part of this magnificent transformation.